American Idol Season 11’s Hollywood Week kicks off tonight and over the course of three shows we will see the over 300 contestants whittled down to 70 for the semi-finals. Steven Tyler, Randy Jackson, and the lovely JLo take some time to give the large group a pep talk and a brief rundown of what they expect in this first round of “Hell Week.” Let the games begin! Ft. Lauderdale’s Johnny Keyser chooses Amos Lee’s “Dreamin” for his first time in front of the judges since the initial audition, he bored the tears out of me and the judges loved him. This was a hard act for Heejun Han to follow as he let nerves get to him, but JLo encouraged him to “shake it out” and he does a smoking rendition of “How Am I Supposed To Live?” One note in and the judges made up their minds they were in love and deliberate for only a few minutes before letting both Heejun and Johnny advance. Baylie “second time’s a charm” Brown and Hallie Day reminded the judges and viewers why we fell for them in the first place. We’ll see them in Round Two. Jen Hirsch won me over by singing my sweetheart Patty Griffin’s “Up To The Mountain.” When she ended the judges said “don’t stop!” Lauren Gray was a standout in St Louis and she proved memorable once again by failing to see Randy’s “stop” signal and kept singing for about 30 more deliciously awkward seconds. She and Jen are the only two from their group to proceed. Phillip Phillips was a bright spot in the Savannah audition but is most remembered for his guitar playing on his version of Michael Jackson’s “Thriller.” He’s without his guitar on “Papa’s Got A Brand New Bag” and I’d say it’s definitely good enough to move on. I’d also say Phillip Phillips is the name to watch, all the way to the finals. Goofy, cutie-pie Reed Grimm sang the theme from TGIF mainstay Family Matters at his initial audition and keeps the eclectic song choices coming with “I’ve Got A Golden Ticket” from the Willy Wonka movie, he was charming and in key but maybe too silly. Travis Orlando had to follow up both of these dynamic performers and he definitely struggled a little. Reed and Phillip are the only two to advance this round and Travis is sent home during Hollywood Week once again. New dad Adam Brock sings “Walking In Memphis” per JLo’s request and despite his tears and misgivings in the clip before he sang, he walked all over that song. He reminds me of a more soulful Danny Gokey. The thing Jane Carey’s voice most has going for it is that she’s Jim Carrey’s daughter. She screeched through her song and while Adam makes it through, she is sent home. Shannon McGrane was a standout in her Savannah audition and continues to impress everyone with her range and soul on Alicia Keys’ “Fallin.” David Leathers was another early favorite who admitted having beaten last year’s winner Scotty McCreery in a local singing contest in their native North Carolina. He did a decent job on his Celine Dion pick but, I heard a lot of weakness tonight I missed in his original audition. Both make it to the next round; I predict this is the last we’ll see of ol’ David. Erika Van Pelt, Creighton Fraker, and Aaron Marcellus are all in this round and all make it through to Round Two. I love Erika’s voice but Creighton’s annoys me and Aaron’s is pretty common and not special enough. Final act of the night Symone Black sings Otis Redding’s “Sittin’ On The Dock Of The Bay” and when the judges ask why she picked that particular song, she slurred her answer a bit before continuing to walk forward right off the stage, presumably hitting her head. Executive Producer Nigel Lythgoe is seen calling for a medic, and of course we must wait until tomorrow night to find out how she is. I’m guessing she’s fine or Idol wouldn’t exploit her… right? Hollywood week footage continues tomorrow and into next week, with next Thursday, Feb. 16 (8:00-10:00 PM ET/PT) taking the remaining contestants to Las Vegas for the Performance Challenge on stage in Cirque du Soleil’s Viva ELVIS Theatre at Aria Resort & Casino in Las Vegas. 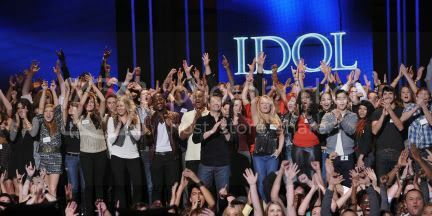 The following week contestants face the judges one final time to sing for the chance to continue pursuing their dreams. The second phase of the competition comes to a dramatic end when the judges reveal this season’s semifinalists Wednesday, Feb. 22 (8:00-10:00 PM ET/PT) and Thursday, Feb. 23 (8:00-9:00 PM ET/PT).